First, let them into the kitchen. Often, we tell kids to "Stay out of the kitchen!" and "Go play!" Sometimes it's for their own safety, but many times it's simply because we don't want to complicate our meal prep. Think twice before running your kids out of the kitchen. At some point (perhaps when they make you breakfast in bed), you'll be glad you taught them to cook for themselves. Sometimes cooking lessons happen spontaneously, but most often, if we don't plan it, it just doesn't happen. Take a moment to look at your calendar and block out a time that you will plan to teach your child to cook. Ideally, this will become a regular practice. For some families, it may be once a week; for others, it will be once a month. Worry less about frequency and focus more on following through on your plan to make it happen. If you've committed to making 75 carefully decorated cupcakes for your friend's bridal shower, this is probably not the time to solicit help from your 6-year-old. You want your child's first experiences in the kitchen to be fun and laid back. If they sense that you're stressed because of a deadline or frustrated because the sprinkles are too heavy, they probably won't enjoy their time in the kitchen with you, and they may decide they dislike cooking altogether. The kitchen requires supervision. Depending on your child's age, you may want to establish a rule upfront that they are only allowed to be in the kitchen with adult supervision. Raw meat makes you sick. Make sure your children understand that raw meat can cause sickness if ingested or handled incorrectly. Teach them to wash their hands throughly before and after handling raw meat and to never reuse surfaces or utensils that came into contact with raw meat until they have been washed with hot, soapy water. Handle knives carefully. If your child is old enough to use sharp knives, teach them to always point a knife downward when walking and to pass knives to others handle first. When teaching kids to cut or slice food, let them practice with soft foods and butter knives until you are confident that they know how to handle sharper knives. Assume the stove (and everything on it) is hot. This is a good way to ensure that your child maneuvers carefully around the stove and always uses pot holders. Clean as you go. Spills and other messes can cause accidents and injuries. It's true. Have you ever seen someone slip on a banana peel? Okay, we haven't either, but nevertheless, food-related falls and injuries are usually avoidable with dedicated cleanup. While it is important to choose a recipe that is age appropriate, be sure to also choose one that your child will enjoy making! What's their favorite food? No doubt, they'll love the opportunity to make that! 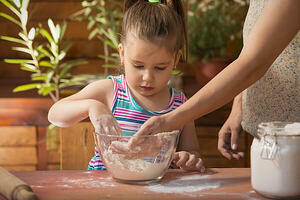 To keep your child engaged while you're cooking together, make sure you're giving them plenty of hands-on experience. This is a team effort. If most of your kitchen time involves you showing and telling, then your child will quickly lose interest. Another way to make cooking fun and interactive is to let them taste test as appropriate. This will also develop their pallet and encourage them to try new things. Last but not least, we think outdoor kitchens are an especially nice place to teach your kids to cook. Not only are they learning a fun and valuable skill, but they are also getting fresh air at the same time. Contact us about getting your outdoor kitchen design started today!